He’s red, he’s not Skeletor, and he’s appearing in the new Captain America movie. Who do you think that could be? Any guesses, my reader chums? Yes, you hit it right on the head. 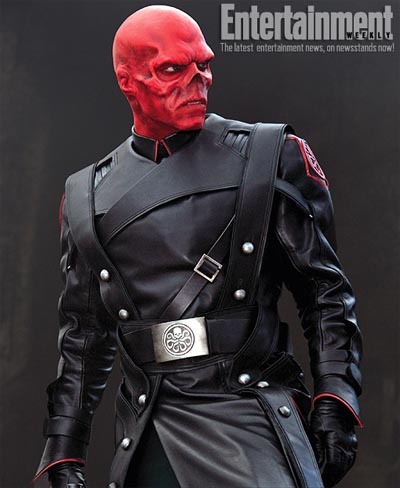 It’s the Red Skull, as featured in the new Entertainment Weekly magazine article out in the USA. My name is Gordon Hamilton. I’m an aspiring writer and avid reader. I picked up your book Kingdom beyond the waves, solely because I liked the cover art and thought the back-blurb sounded enticing. I’m about half-way through right now and am really enjoying the experience (you’re dual-plot cliffhangers make it frustratingly difficult to put it down). My main reason for tracking you down is because I was thinking how helpful it would be to have a map to go along with this story. I like maps, helps me keep it all in perspective. Just wondering if you had any that you’ve done up that you’d be willing to share with fans. Thanks. Yep, I’ve heard the map point raised many times in the past. I’m getting there… slowly… watch this space!